It was the “worst day”. This worst day was a day when the World Trade Center in New York City tumbled down killing thousands of innocent Americans inside of it. A worst day which occurred September 11, 2001 that has become known as “911”. This worst day is how young boy, only nine-years-old, Oskar Schell (Thomas Horn) refers to it is also the day he lost his father Thomas Schell (Tom Hanks) and Linda Schell (Sandra Bullock) lost her husband when he jumped out of a window on the 107th floor to escaped the flames caused by the terrorists attacks on the World Trade Center. Warner Bros. Pictures “Extremely Loud and Incredibly Close”, directed by Stephen Daldry (Billy Elliot, The Hours), is the story of Oskar whom sets himself out on a journey to bring his father, whom was also his best friend, back one year after 911 by perpetually replaying the events of that fateful morning over and over again in his head and reliving it in a private shrine inside his cupboard. His obsession becomes the lock that a mysterious key fits that was found inside of his deceased father’s closet in an envelope labeled “Black”. Oskar jumps-in deep with the skills taught to him by his father in order to help Oskar overcome his Asperger’s Syndrome with a fantasy search in New York for the “Sixth Burrow” and ventures out on a city wide search for the owner of the key by contacting every person with the last name of “Black” in the phone book. “Extremely Loud and Incredibly Close” refers to how Oskar experiences the world while coming in contact with strangers and inanimate objects – airplanes, public transportation, yelling, loud noises- and the anxiety that follows on a daily basis. His journey is one in which is an attempt to bring back his father. The search ends when the owner of the lock is found resulting in a surprisingly parallel situation for Oskar. 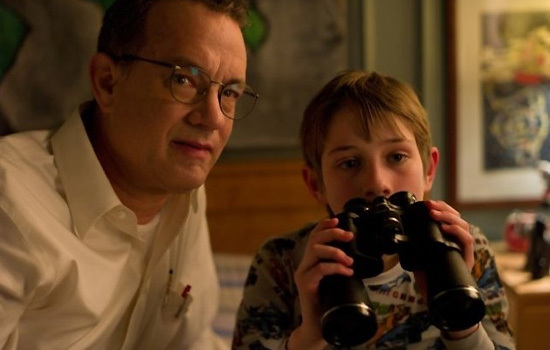 “Extremely Loud and Incredibly Close” is a the first film I’ve seen that involves a 911 plot-line. It was incredibly close in that it really hit home and stirs all the emotions felt by all Americans that fateful day and the days that followed. Sandra Bullock and Thomas Horn give extremely excellent performances in this film that will move audiences to tears. The film also stars: John Goodman and Viola Davis. Other great performances are by Max von Sydow as “The Renter”, Zoe Caldwell as Oskar’s Grandmother, and Jeffrey Wright as William Black. The storyline is very poignant and the focus on one young boy of how 911 effected his life is also the story of everyone that was personally affected by that day experiencing a loved one lost. 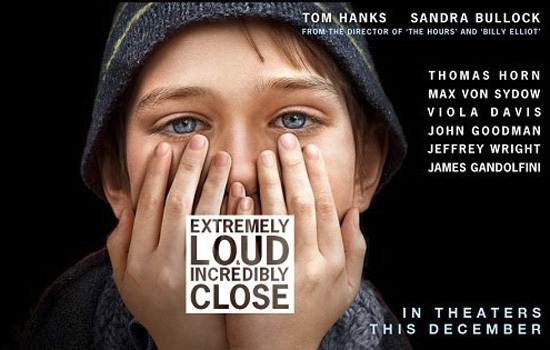 “Extremely Loud and Incredibly Close” opens in theaters Sunday, December 25, 2011.